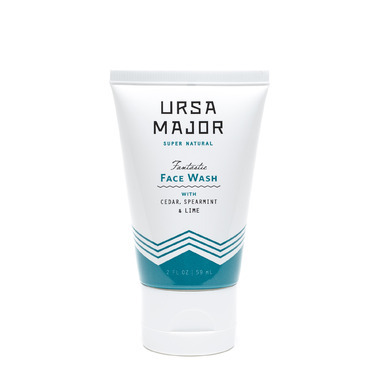 Ursa Major Fantastic Face Wash is a foaming gel cleanser with a natural brightening complex. Now in a convenient travel size! Directions: Wet face and hands with warm water. Pour quarter-size dose into palm and use hands to activate formula. Massage thoroughly over face, neck and around ears… enjoy. Leave on for 30-60 seconds for an extra hit of exfoliation. Rinse well. Use AM, PM and after exercise for clear, healthy skin. Never any petrochemicals, sulfates, parabens, synthetic fragrance or color, glycols, silicones or PEGs. This product is gluten-free, vegan & cruelty-free. Made in USA. the scent is not that great. This removed all make-up with ease. It smells terrific and does not dry out your skin. I will be purchasing this again.